John Stamos and Mark McGrath were beefing at the party because Stamos challenged McGrath for not taking more of a leadership role in Kimmel’s band room, where Howard jammed with David Arquette, Ashton Kutcher, and Kimmel, who plays harmonica. 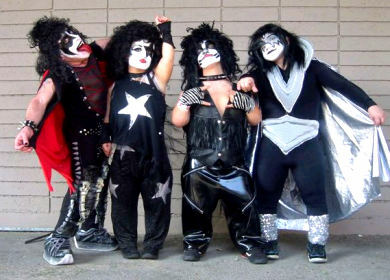 John Stamos is afraid of midgets and was uncomfortable when Kimmel sent the midget band “Minikiss” into his dressing room when a guest of Kimmel’s television show. Demi Moore and Courtney Cox were there with their husbands, and watched the above mentioned foursome play, which included Howard on guitar for a rendition of Louie Louie. Rickles wasn’t the only comedian snubbed. Howard 101 host but fine comedian Greg Fitzsimmons was invited to the party, though Howard did not take notice of him there. Survivor host Jeff Probst was uncomfortable at the party because Howard was goofing on him. Probst, who rearranged his schedule to attend the bash, said he didn’t like the interrogation, and had postponed travel plans to make the party. He had to fly to New York on a red eye on Saturday morning. Kimmel also took flack for ranking Fred last in popularity among Stern show personalities, saying that Fred is given too much credit for his intelligence, and that people are afraid to challenge him even though sometimes he is wrong. Jimmy also took issue with Robin, who said earlier in the week that Kimmel was close in age to the 60 year old Quivers. “Robin, how old do you think I am? I’m 42 years old!” Kimmel said. Christa Miller (above), and her husband, Scrubs and Cougar Town producer Bill Lawrence also attended Kimmel’s party. Miller called in the Stern show this week as well.